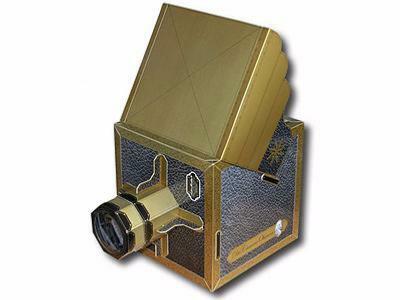 This cardboard construction kit allows you to build your own camera obscura. This optical instrument is the fore-runner of the modern camera. The lens at the front is used to focus an image, via an internal mirror, onto the transparent screen at the top. By placing a sheet of tracing paper on top of this transparent screen, you can view the image clearly, and also make a tracing of the outlines of the image.In centuries gone by, artists used the camera obscura as an aid to composition. Canaletto is believed to have used the instrument, and also Vermeer. 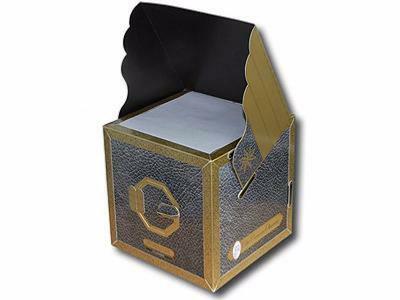 The image appears in full colour.This luxury cardboard kit contains a number of sheets of heavy duty, pre-printed, pre-punched cardboard, plus lenses and all the other pieces needed to construct a camera obscura. You will need to provide the glue.